You may perhaps be looking into Yoga and are looking to get started and just want to know more or you have done Yoga before but was unaware of the different types of styles available. Either way, there are different styles and each encompasses a different style of Yoga. 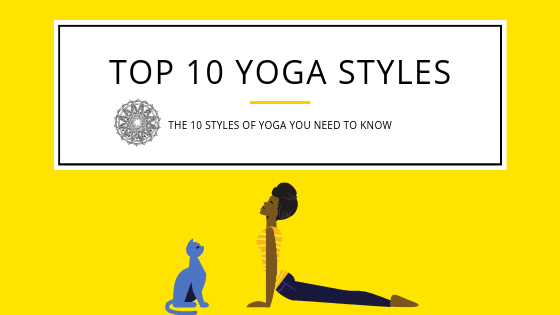 In this blog, we will summarise the top 11 major Yoga styles available. “Hatha” is a Sanskrit term, which is an umbrella term for all physical postures of yoga. In the west, hatha yoga refers to all of Yoga that is focused on physical movement. However, there are Yoga branches such as kriya, raga and karma yoga that are separate from the physical-based yoga practice. Physical-motion yoga is perhaps amongst the most popular styles. Hatha yoga classes are best for beginners since they are usually paced slower than other yoga styles. They are an entry point for developing breathing techniques and exercises. If you’re new to Yoga than this would be your starting point for Yoga. This style was founded by B.K.S Iyengar and focuses on more on posture through slow movement of the body. Whilst moving students perform a variety of postures while controlling their breathing. Iyengar relies heavily on props to assist students to perfect their form in a safe manner. With less movement, but also allowing you to feel incredibly open and relaced an Iyengar class. This is ideal for those who have sustained injuries or are required to work slowly and methodically. Kundalini focuses on the balance of spirituality as well as the physical element of yoga. It places kundalini energy at the center of the practice. It is said that the Kundalini energy in your body is trapped, or coiled in the lower spine. The classes are known to work your core body whilst challenging postures along with breathing exercises. These classes can be intense and can involve chanting, mantra, and meditation. Asthanga is regarded as the “Eight Limb path” in Sanskrit. It involves a very physical sequence of postures, so ideally not something you should try on your first attempt at yoga. It takes a well-experienced yogi to really indulge and enjoy it, so it’s not a good entry point for beginners. Ashtanga starts with five sun salutation A’s and five sun salutations B’s and then moves into a series of standing and floor postures. Vinyasa means “to place a special way”, which refers to yoga postures. This is the most athletic style of yoga. This style was adopted from Ashtanga yoga in the 80’s. The movement is coordinated with your breathing and movement, so each breath should correspond to a new posture. Want to sweat it out? This yoga style is perhaps for you. Bikram is named after Bikram Choudhury and features a combination of poses in a heated environment similar to a sauna. It’s typically set to 105 degrees and 40 percent humidity. The sequence includes a series of 26 basic postures, with each one performed twice. Yin Yoga is a slow-paced style of Yoga with seated postures are held for a long period of time. This is an ideal class for beginners. The postures are held from 45 seconds up to 2 minutes. Yin can also be practiced as a meditative yoga practice that helps you finder inner peace. This class is very relaxed, as you’re supposed to let gravity do most of the work. Ever have a busy and tiresome day? Well, this style of yoga allows you to focus on body relaxation. At its core, this style helps you wind down, you spend more time in fewer postures throughout the class. Many of the postures are modified to be more relaxing and easier. Similar to Iyengar, many props are used and are placed such as blankets and eye pillows. Prenatal is for “mums to be” and is tailored to women in all trimesters. This has been suggested to be one of the best types of yoga for expectant mothers because of the pelvic floor work that is associated with this style. It also helps mums prepare for labor and delivery. This is the modern-day hatha yoga, most similar to vinyasa in that the focus is on alignment but also on the mind-body-heart connection. This style focuses on spirals and hoe each body part should be moving. Anusara is also known for its emphasis on heart opening.